IN A SUBTERRANEAN retreat that he has built in the cellar of his home, John H. Schall, Jr., twenty-three-year-old medical student of Brooklyn, N. Y., pursues his spare-time hobbies of magic and chemistry. Colored lights and ingenious theatrical effects, devised for the entertainment of his friends, provide a setting suited to represent an imaginary meeting place of alchemists and sorcerers. Through a coffin-shaped entrance, guarded by a skull with flashing green eyes, a visitor steps into a dimly lit “alchemist’s workshop” where an arched grotto, housing microscope, retorts, and graduates, is bathed in blue light from a hidden source. 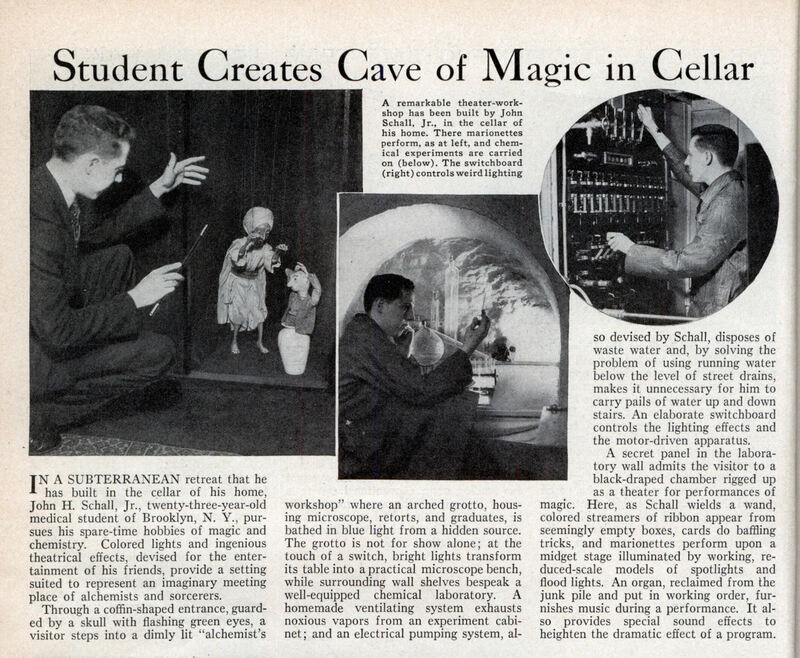 The grotto is not for show alone; at the touch of a switch, bright lights transform its table into a practical microscope bench, while surrounding wall shelves bespeak a well-equipped chemical laboratory. A homemade ventilating system exhausts noxious vapors from an experiment cabinet; and an electrical pumping system, also devised by Schall, disposes of waste water and, by solving the problem of using running water below the level of street drains, makes it unnecessary for him to carry pails of water up and down stairs. An elaborate switchboard controls the lighting effects and the motor-driven apparatus. A secret panel in the laboratory wall admits the visitor to a black-draped chamber rigged up as a theater for performances of magic. 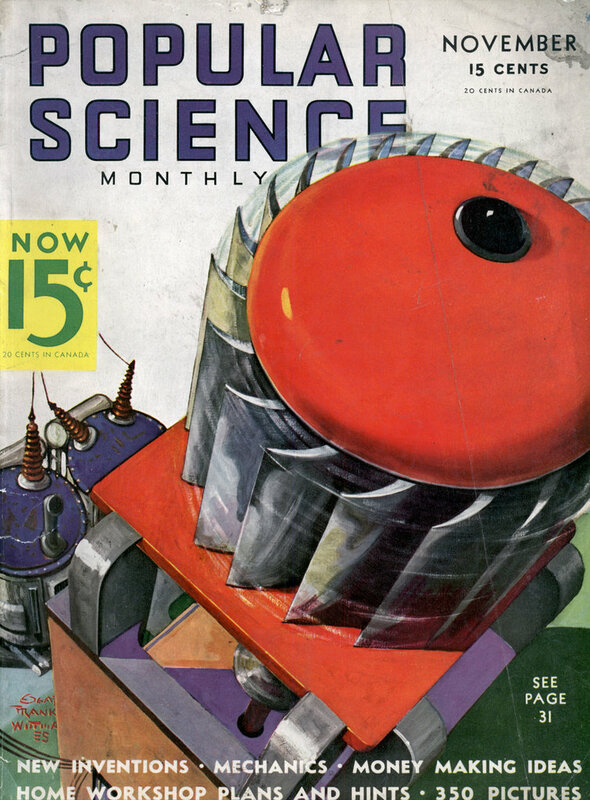 Here, as Schall wields a wand, colored streamers of ribbon appear from seemingly empty boxes, cards do baffling tricks, and marionettes perform upon a midget stage illuminated by working, reduced-scale models of spotlights and flood lights. An organ, reclaimed from the junk pile and put in working order, furnishes music during a performance. It also provides special sound effects to heighten the dramatic effect of a program.